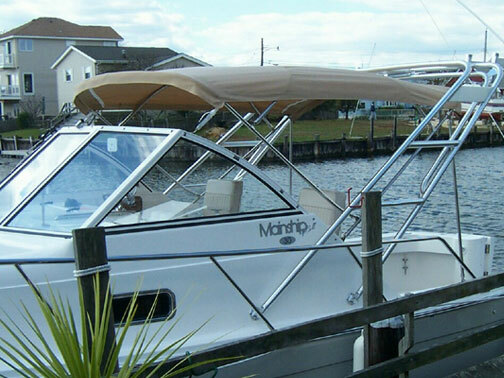 An arch in elemental form, two continuous one-piece loops of schedule 40 marine grade aluminum pipe nearly 2 inches in diameter form the foundation of this Atlantic Towers Structure. Reinforced with a truss/handrail (approx. 1 1/4” o.d.) 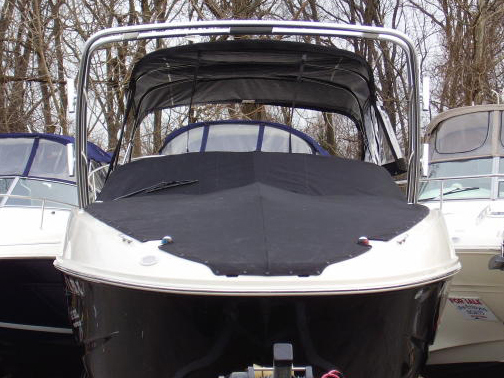 and combined with our exclusive ATL4 & ATL 5 Mounting Plate Extrusions, (click here to learn more about ATL 4 & 5 extrusions) The Custom Fishing Arch can be shaped and configured to complement the lines of any Walk Around Fishing Boat or Trailerable Express Cruiser (to about 26’x8’6"). Plus it’s strong enough to handle a full range of gear. 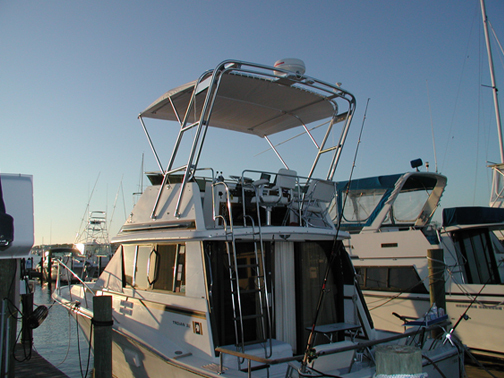 Dress this Atlantic Custom Fishing Arch with a full complement of antennas, radar, outriggers and rod holders. 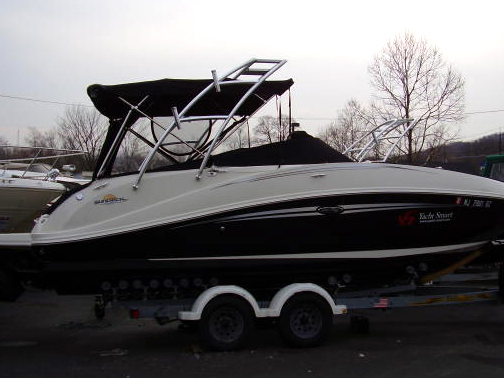 It can even handle a tow fitting for watersports. 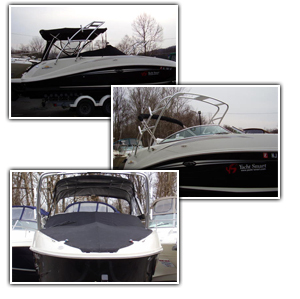 • Full size center Radar Plate, with trim panel under* concealing mounting bolts and wiring. 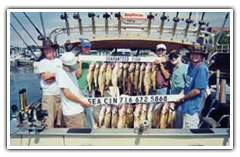 • click here for detailed info on self trimming mounts. 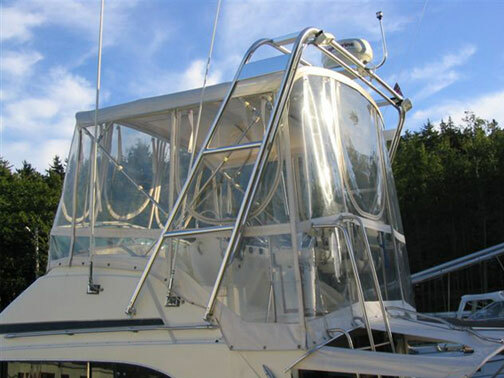 The Custom Radar Arch is a fully trussed structure. 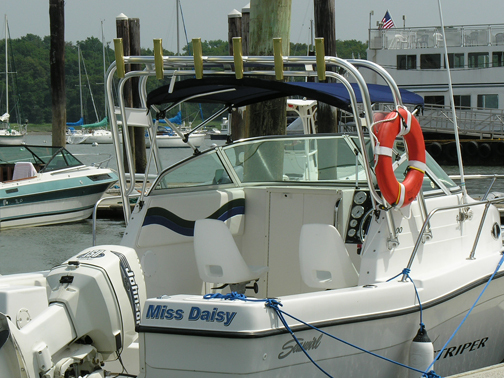 Unlike the Fishing Arch, the Custom Radar Arch has a crowned or curved top section and gusseted corners, Custom built for boats up to approximately 65’. Atlantic Custom Radar Arches are all made from schedule 40 aluminum pipe measuring nearly 2" in outside diameter. 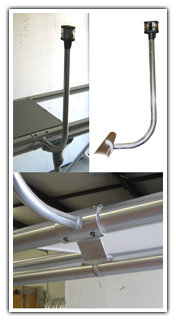 The graceful arc across the top of the arch greatly increases the static weight and dynamic loads the arch can handle. 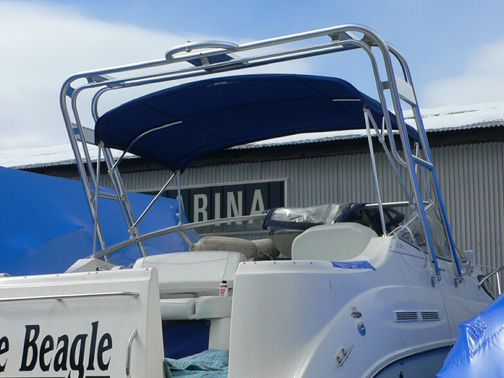 The Custom Radar Arch can handle the largest radar and it can also be fitted with lifting eyes to function as a gin pole, or even converted to a full hardtop. The structure of the arch is hollow so that wiring can be concealed inside. 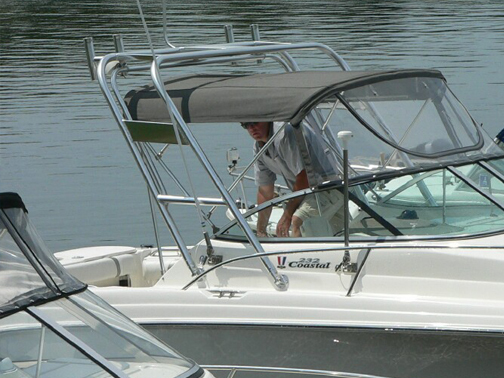 Custom built for most boats, each Custom Radar Arch is unique to the specific Make and Model boat for which it is designed using our proprietary data base of specifications for over 1000 power boat models. 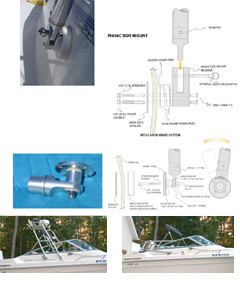 The angle, taper, side spacers and beam dimensions are all customized for individual boat models and owner preference. 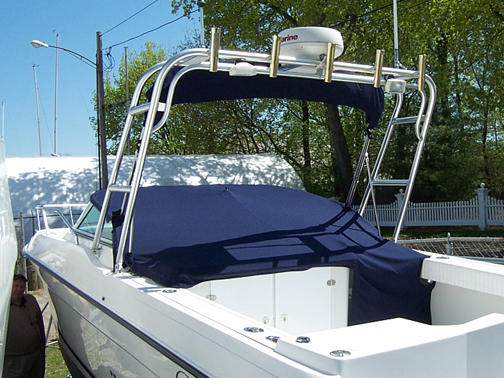 The Custom Radar Arch is typically designed to mount to the side of the Flybridge or the windshield trail with back-up plates on express style and larger walk-around boats. 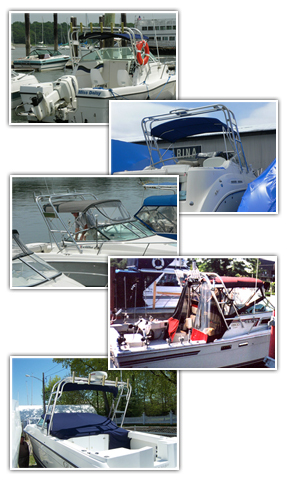 Flexible mounting system also permits "flat" mounting to the gunnel or cabin top. 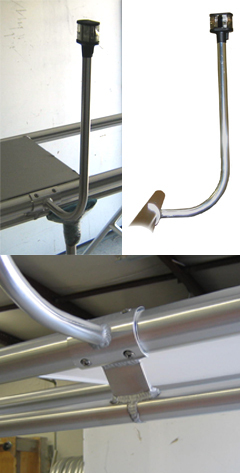 It can be designed to fit over and around your existing canvas top without interference. 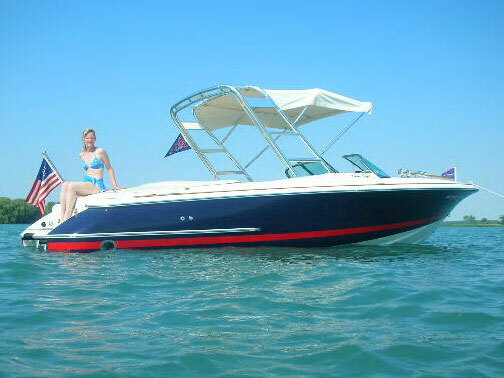 Styled to complement “swoopy” new bowriders, fun decks and express cruisers, the Deluxe Custom Arch can be designed to rake forward or aft, and is available with the full complement of Arch Options. 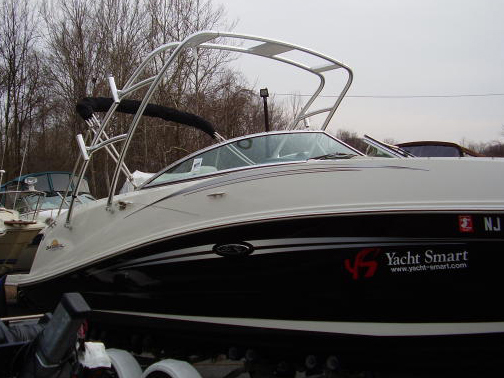 Custom built for most boats, each Custom Deluxe Arch is unique to the specific Make and Model boat for which it is designed using our proprietary data base of specifications for over 1000 power boat models. 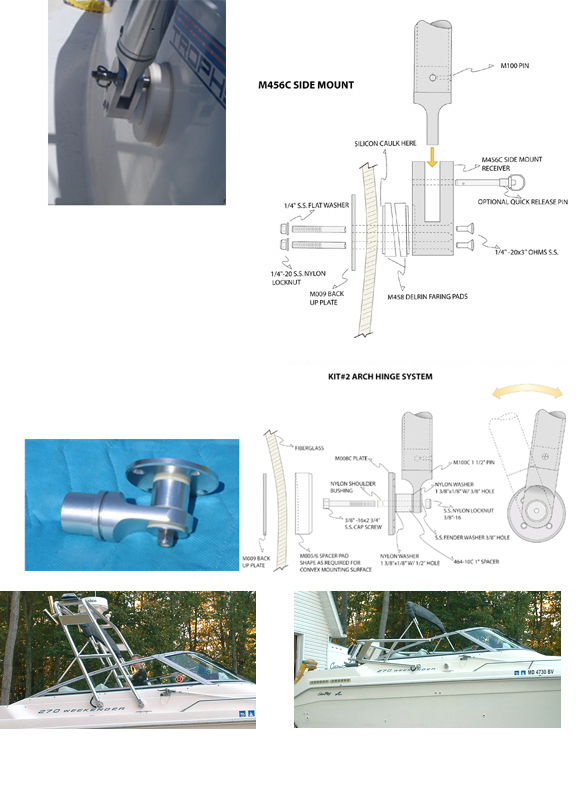 Fully radiused from every view, the angle, taper, side spacers and beam dimensions are all customized for individual boat models and owner preference. 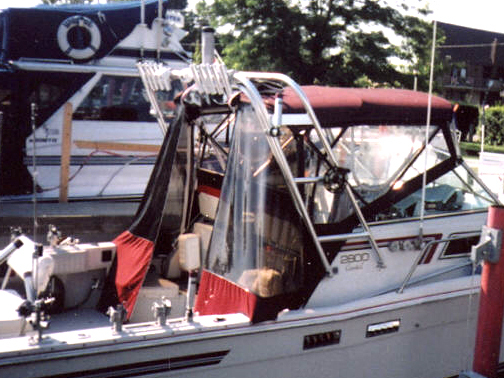 The Custom Deluxe Arch is typically designed to mount to the side of the cabin with back-up plates on express style boats. 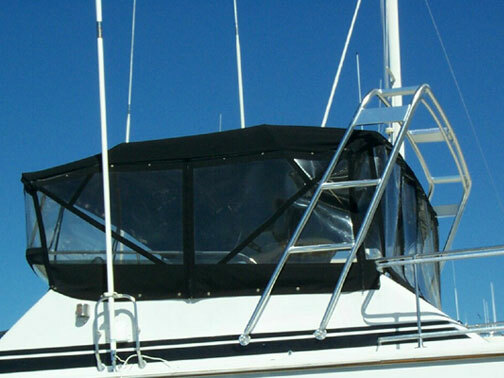 It can be designed to fit over and around your existing canvas top without interference. 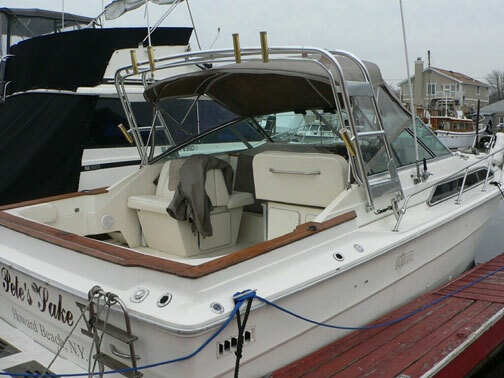 55 watt conventional halogen deck flood lamp with replaceable bulb in waterproof housing. Current draw, 4.8 amps each, 9.6 amps a pair at 12 volts. 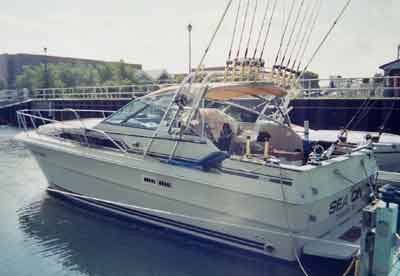 Wire with minimum 14 gauge (always used tinned stranded wire for marine applications). Includes choice of mounting bracket to fit any Atlantic Towers structure. See the ACCESSORIES section of our website for a full range of additional bolt-on options. All Atlantic Towers Custom Arches are completely engineered products. The are ready for installation without any field welding when they leave our plant. As a result. They can be packed and shipped anywhere in the world. Custom Arches are bolted upright to a shipping frame. Prior to installation the extra material in the legs is trimmed. The arch is wrapped in multiple layers of quilted shipping pads and plastic. 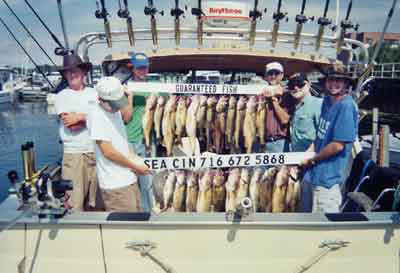 Rod holders and other equipment receives additional protection from wood strips and corner board.